A NEW RULE IN ALGEBRA. Five from Three and One remains!! or "The Three Mexican Prisoners, having but one leg between them all!" A biting, somewhat morbid satire about the fate of wounded Mexican prisoners of war in the hands of American doctors. 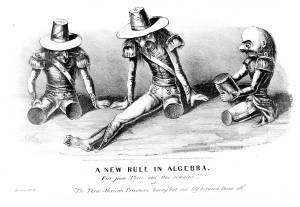 During the Mexican War amputation was considered the surest way to prevent the infection of an injured limb. The cartoon shows three Mexican soldiers seated, in obvious alarm, on the ground. Of the three men, only the soldier in the center has a leg remaining. The words "Series no. 2" appear at lower left, suggesting that the print was one of a larger group planned or actually published by Jones and Newman.